Later, as she attended a Palm Sunday service she watched the Bishop as he processed down the aisle handing palms to the eager parishioners. They surged forward grasping for a palm hoping to be a blessed spiritual experience. Clare remained where she was and watched. The bishop noticed her and pushed through the crowd to hand one to her, specifically.Evidently, Clare took this as a final confirmation of God's calling in her life. She left her family that night and fled to where Francis was. At her request, he cut her hair, gave her a rough brown robe to wear, and helped her start a journey of devotion to the Gospel and love. As she laid aside her expensive clothes and donned a rough brown robe with a rope for a belt, she continued the process that started with her first profession--the redemption of her heart, mind, soul, and body. 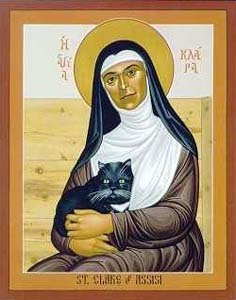 Many would endeavor to release some of the restriction that Clare placed upon herself and her order (who would become known--after her death--as the "Poor Clares"). They hoped to rescind the vow of corporate poverty and provide for the needs of the women by providing corporate possessions since they viewed an order of cloistered women in abject poverty as impractical. Clare resisted this change because she understood the vow she and her compatriots had made as important and formative. They had cast away everything so they might find the Kingdom. They had died to self so that they might find life and they had no interest in anything less. 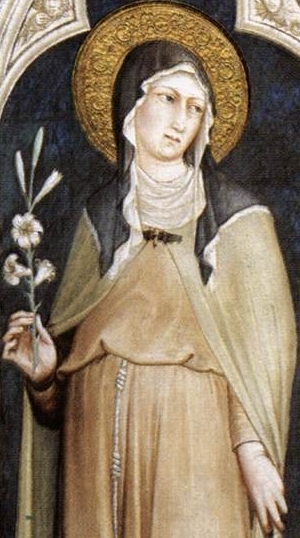 Pope Gregory IX suspected that Clare was afraid to change because she would be violating a vow she had made and, therefore, sinning. He offered to absolve her of the sin. She responded: "Holy Father, I crave for absolution from my sins, but not from the obligation of following Jesus Christ." The vow of poverty was upheld at Clare's insistence.For Clare, a life that lacked devotion and obligation was of no value. She turned away from the life of privilege that her Count father and Countess mother had provided her because she understood is as saccharine sweet indulgence. She yearned for life more abundant and deeply lived than what the world could offer. In her devotion--in her much sought obligation--she found the Kingdom. In finding the Kingdom, she was transformed into an instrument of mercy, grace, peace, and love in the world. Her life, and the life of her order, impacted many in their pursuit of the narrow way of self-sacrifice and love that is the Kingdom of God.